Digital dental radiographic records or “digital x-rays” are the latest technology used to take dental x-rays. Digital x-rays technique uses an electronic sensor (instead of x-ray film) that captures and stores the digital image on a computer. 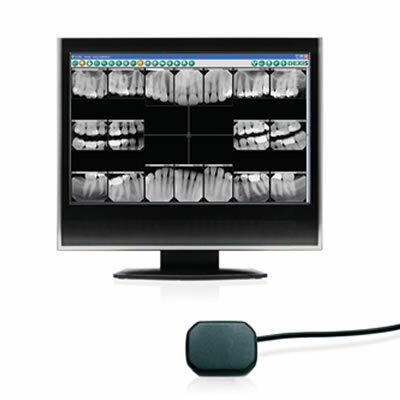 The image can be instantly viewed and enlarged helping the dentist and dental hygienist detect problems easier. Digital radiographs reduce radiation by up to 75% compared to traditional dental x-rays. Dental radiographs are essential, preventative, diagnostic tools that provide valuable information not visible during a regular dental exam. They accurately detect hidden dental abnormalities and enable Dr. Huang to complete an accurate treatment plan. Without radiographs, problem areas may go undetected. They are essential in detecting and treating dental problems at an early stage, which is more likely to save you time, money, unnecessary discomfort, and your teeth! Are digital dental radiographs safe? Yes! They are extremely safe. With digital radiography, our patients are exposed to the lowest levels of radiation possible. Studies have shown that digital radiographs produce 75% less radiation exposure than traditional film radiographs. Here are some of the advantages of digital x-rays! Even though digital radiographs produce very low levels of radiation and are considered very safe, we still take every precaution to limit the patient’s exposure to radiation. These precautions include only taking those radiographs that are necessary, and using lead apron shields to protect the body. The amount of radiation exposure to the patient from a full mouth series of 18 digital radiographs is equivalent to 5 minutes of the natural radiation we are exposed to in our environment on a daily basis. What kind of dental radiographic records should be taken? A full mouth series of 18 individual digital radiographs is required for all new adult patients to aid in the detection and diagnosis of common dental problems such as periodontal disease, tooth decay, abscesses, or failing restorations. A thorough, comprehensive examination cannot be completed without this full series of radiographs. This full series of 18 digital radiographs may need to be updated every three to five years. Check-up radiographs, which include a set of 7 individual radiographs, are taken at periodic check-up visits twice a year to help detect new dental problems.